I have noticed over the years that I have less material interests. I used to buy new clothes for the holidays every year, but I have not bought a new suit for at least fifteen years. The old ones do just fine, and I no longer enjoy the shopping experience. Although I live in the present, I am nostalgic about the past. There is a scene in Still Mine, which captures this nuanced approach to aging. Craig Morrison, in his 80s, is looking at a dining room table he crafted many years ago. When he first constructed it, he would be upset whenever it was scratched. Now the scratches are things to admire, precious memories of events that occurred around that table. I imagine this view of material things is a part of getting older. We become less focused on things and more focused on the intangibles of life, the precious conversations with family, the time we spend developing our souls and minds. It is not necessarily a time of retirement, but a time when we see life differently and treasure the moments of connection with others. This special rhythm of life is captured in Still Mine, an engrossing story of a man determined to actively care for his wife in the twilight of their lives. As time moves on and Craig continues to build his new home for Irene, he comes up against unsympathetic bureaucrats who present him with more and more rules with which to comply, resulting in a long list of building code violations that threaten to nullify all his efforts to provide comfort and peace of mind to Irene as her dementia advances. Based on a true story, Still Mine describes Craig’s fight to build his dream house for Irene in spite of many obstacles. The discussions between him and his children about how to care for Irene illuminate the various approaches we can take towards care of our elderly parents. There is more than one way, and Jewish law suggests we have to consider carefully all possible remedies and their ripple effects. Two Talmudic scholars of the past, Maimonides and Raavad, suggest alternate approaches. Maimonides in his Code of Jewish Law writes that a child should always care for his parents unless the situation is severe, in which case one can hire third party professional caretakers. The Raavad, a contemporary of Maimonides, rules differently and insists that the family should remain as the caregiver of the parent, no matter how severe the malady, and not delegate others to fulfill their family responsibilities. 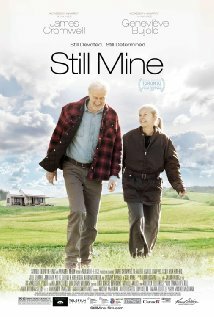 Still Mine shows the complexity of decision-making when it comes to the care of aging parents, and asserts the power of mature love to overcome even the most challenging of circumstances.